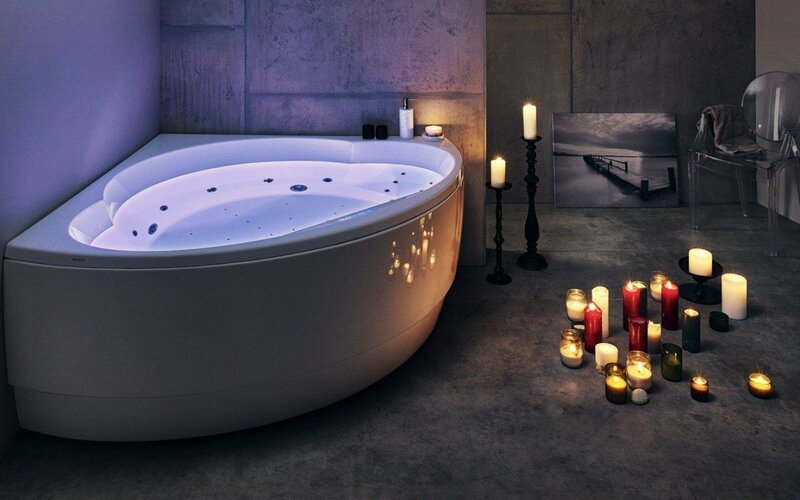 In this article we are going to talk about whirlpool bathtubs. Their difference from hot tubs and jetted tubs. Do you know what is the difference between air-massage and water-massage. We will help you to discover it. So what is a whirlpool bathtub? and how does it differ from a jetted tub or hot tub? What is a whirlpool tub in nature? It is a body of swirling water that is created when two opposing currents of water meet. They can be found in rivers, lakes, weirs, dams, and oceans can be large or small, gentle or really strong. Taking this inspiration, bath designers began to look at ways to circulate water or air through a bath to add to the bathing effect as far back as mid last century. Today’s mechanisms are, of course, much more sophisticated and fail-safe. In a whirlpool bath, the same principle of water movement applies. The bath draws in its own water out of the bath, which is heated then shoots it back into the bath via jets. The currents of water from the jets meet the water in the bath to create the whirlpool effect described above. Because the water shooting from these jets is under high pressure, it creates a massage-like effect which can be targeted for deeper effect on your body. Jetted tubs can be achieved by either water jets or air jets. 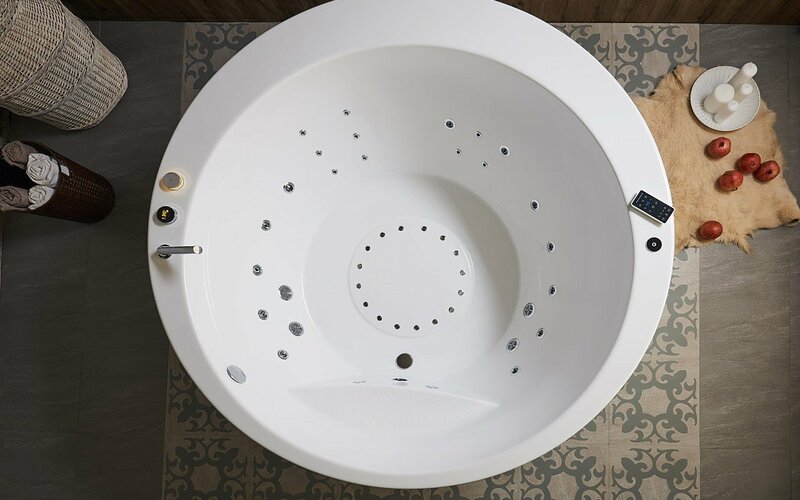 Water jetted tub is very similar to a whirlpool bath, however, an air jetted bath operates quite differently, drawing in the air then directing that into the bath in a constant stream of bubbles. This creates a much softer effect, producing millions of bubbles across a larger area of the body, so is less like a massage and more like a gentle caress. A hot tub is nearly always located outdoors and unlike a jetted or whirlpool bath does not require filling each time it is used. Instead, the water is treated through a filter and cleaning system, with the addition of cleansing agents such as chlorine to maintain it at a hygienic, balanced level. It also includes its own heating elements as it needs to be heated for each use. It can have similar water and/or air jets for relaxation and massage but is a different kind of bathing experience. Whirlpool tub or water jetted baths, also often described as hydromassage or hydrotherapy baths, deliver a quite different sensation to air jetted baths and are generally regarded to be more therapeutic. This is because the high-pressure water issuing from the jets delivers a deeper massage effect on specific, targeted body parts. Pinpointed water jets can help ease tired, aching muscles, alleviate muscle and soft tissue injuries such as lower back or neck pain, ease sports injuries, stimulate blood circulation and relieve the discomfort of pregnancy or monthly cramps. Hydrotherapy is also a proven method to assist rehabilitation. Here the jets deliver a stream of air bubbles through the water. This is more diverse, covering a wide area of the body and as such is softer and less targeted. Air jetted baths will relax but can’t give that harder, targeted massage effect. Aside from the obvious differences of sensation, whirlpool tub jets heat the water before re-introducing it to the bath, which helps to keep the water warmer for longer. On the downside, this recirculation of the water can mean more rigorous maintenance of the bath is required although a regular running of cleaning solution through the jets will usually suffice in keeping these tubs clean. You also need to ensure there is no standing water left in the system when it is emptied and you should never run the jets unless the bath is full. This is a more all-over, bubbly effervescent feeling, although still very relaxing. But here, the air pulled into the bath tends to be warm rather than hot, which can lead to water cooling far quicker. On the upside, the air jets require little cleaning. Simply drain the bath and run the jets until the tub and jets are completely dry. 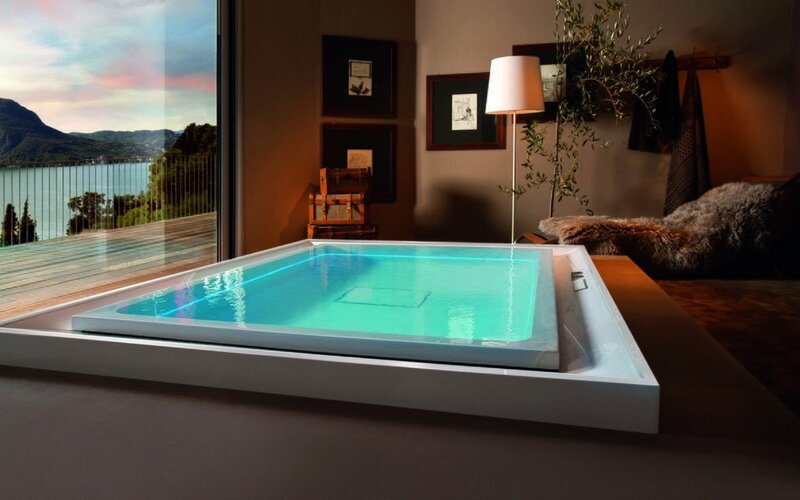 A hot tub can deliver the same high pressure, massaging sensation as water jetted bath. But a hot tub is a different kind of experience as it is usually outdoors and may often be more of a social occasion than a private relaxing bath in your own bathroom. The hot tub doesn’t need to be emptied after each use but does need regular maintenance to ensure it remains hygienic. It also requires heating before use which may depend on the volume of water, come at high energy use. 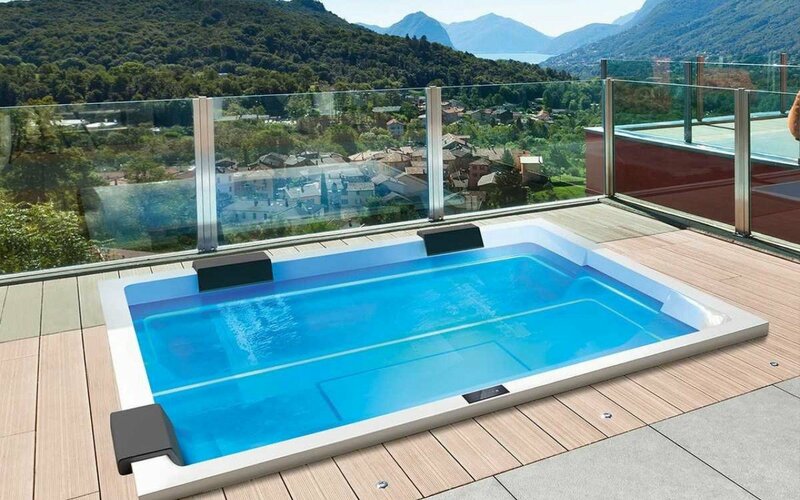 Due to its weight, a hot tub needs good foundations for installation. Ultimately this comes down to what you want from your bath – higher pressure massage type water flow or gentle overall relaxation, together with what fits best in your bathroom space. Take a good look at the jet positions in each bath option offers - a good solution should incorporate multiple back massage jets, plus side, base, and foot massage jets, with complete and easy to use controls, giving you full discretion of all bath functions. Finally, you will find that quality bath manufacturers such as Aquatica offer a range of air jetted baths such as Trinity Relax and Emmanuelle 2 and water jetted baths such as Purescape 174B, Infinity, Pamela, Allegra, and Olivia. You will find that a number of these now combine both functions in the one tub, such as the Cleopatra HydroRelax which uses air jets to assist the power and style of the hydromassage. 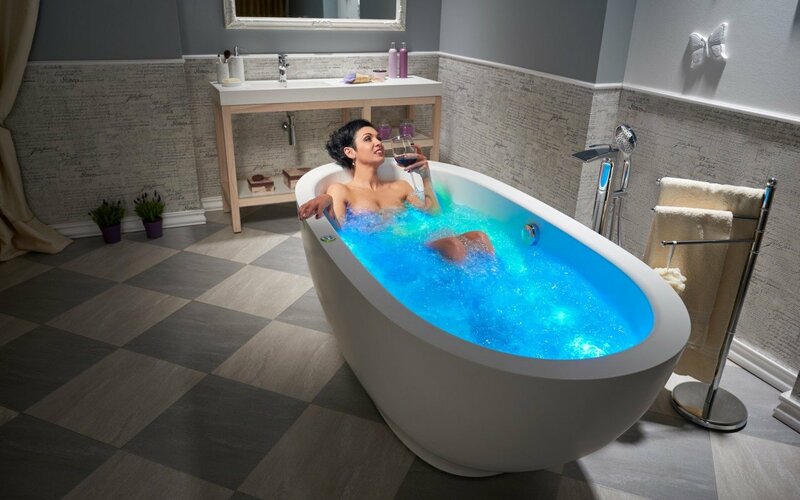 Or you could cover all your bases with our stunning Aquatica Fusion Cube Hydro Relax Jetted Outdoor/Indoor Bathtub. 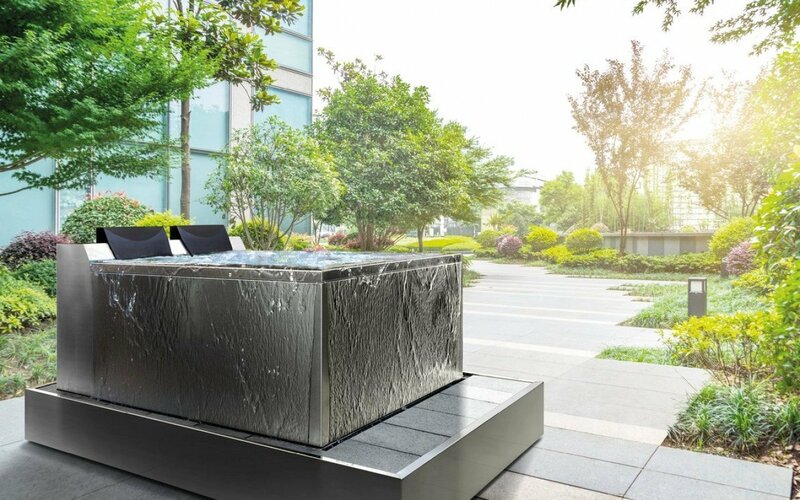 This wonderful example of the apex in luxurious bathing combines hydro massage with air-assist massage and can be supplied for bathtub application or alternatively, as an advanced spa pack for outdoor spa (hot tub) application where emptying the water after each use is not practical. The spa configuration includes a sand filter and UV-C disinfection system.